Every day we are reminded of the brevity of life. In the midst of life, there is death and in the midst of death, there is life. Just as in nature, life has its seasons. The summer of youthful energy and excitement soon fades into autumn, with all its colourful experiences and maturity. Nevertheless, there is also the awareness of change and fading beauty. It is just a matter of time before autumn is replaced with the harshness of winter. For some, the winter of life is approaching fast, perhaps faster than they ever imagined. The Bible warns that there is no time to waste. Scripture says: "It is time to seek the Lord and to flee from the wrath to come". We must ready ourselves spiritually before the cold breath of winter and death calls us from our earthly existence. 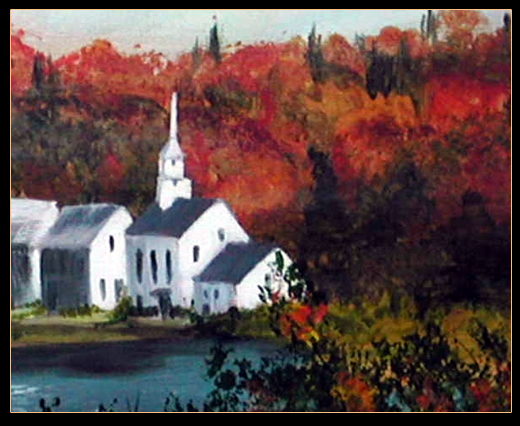 In her painting, "Little Church in Autumn", Kim captures the magnificence of this special season, which we call autumn. This beautiful country church stands surrounded by a spectacular array of autumn colours, but soon, those very same trees will lose their colourful leaves and everything will seem empty and desolate. Interestingly, although the seasons change, the church doesn't. It doesn't change in its appearance and it doesn't change in its message. Only by being in time, can you experience the true reality of Thanksgiving. The Bible exhorts us to "give thanks in all things". May God, in His mercy, grant you the special blessing of being able to thank Him for His unspeakable love; His indescribable gift, the Lord Jesus Christ; and His unfathomable salvation!